Unit is a 15 Watt Controller, and may arrive with Part Number SCC005 or SCC015. Use this controller with any of the panels we sell, from 5 to 15 watts! Battery Minder solar controller. This controller is the same unit used on the BatteryMinder 5 and 15 watt kits, and can be used on any solar panel from 5 watts up to 15 watts. This controller will prevent your battery from getting overcharged, as well as remove and prevent harmful sulfation via the BatteryMinder Patented High Frequency Pulse. Prevents sulfation buildup on new batteries. Do you own the SCC15? Please, tell us what you think about it. It helps us provide you with better products. Please note that it may take up to 72 hours for your review to appear. Pros: I knew in general terms what I wanted having purchased a mains-powered version of this product years ago. But the devil's in the detail, and I received first rate help defining the exact version of the product I need for my specific application. The response to my inquiry submitted via the website was prompt and answered the questions. Ten out of ten -- thank you! Pros: Put this and a 15W panel on my camper and have been VERY happy with it. I always had problems with camper battery dying over a long weekend of dry camping. Even with replacing all the lights with LEDs, after a couple days the battery was so dead the generator wouldn't even start. Since installing this system I haven't had a problem. Probably could use a 30-60W panel but if it works... don't fix it. Cons: Originally purchased to run a web camera off grid but undersized the panel (needed a 30+ W). My solar guru friend recommended the desulfator and swears by it. I think that it shorted out my OLD battery after several months of running on it shorted out a few of the cells. I would guess that it broke loose all the sulfites built up on the plates faster than it could dissolve them? Well it is my theory and I am sticking to it. My new battery has been running great on this system... my friend tells me he has a few 10 year old batteries that are still working great since they have been on the desulfator circuitry. Pros: seems to be doing the job. 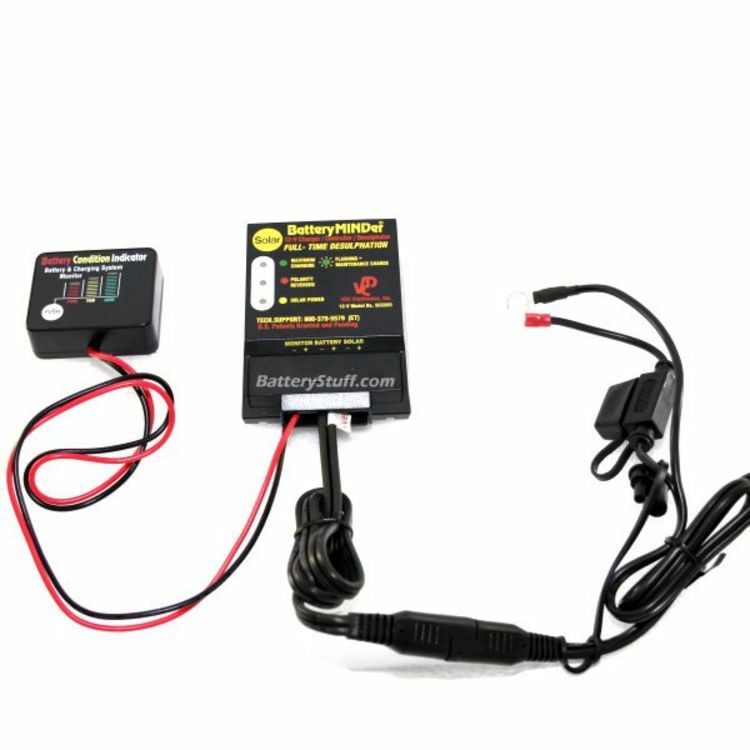 I have an 2 prong SAE type connecter and voltmeter and the voltage to the battery pulses as advertised when fully charged. No problems to report so far..
Cons: A little pricey.. the connection block seems a little cheap but has worked fine.